Just in time for the upcoming Perseid meteor shower, a new meteor surveillance station has come on-line at Meteor Crater, Arizona. A box of 16 off-the-shelf video surveillance cameras is used to monitor the night sky for meteors over the famous impact crater. 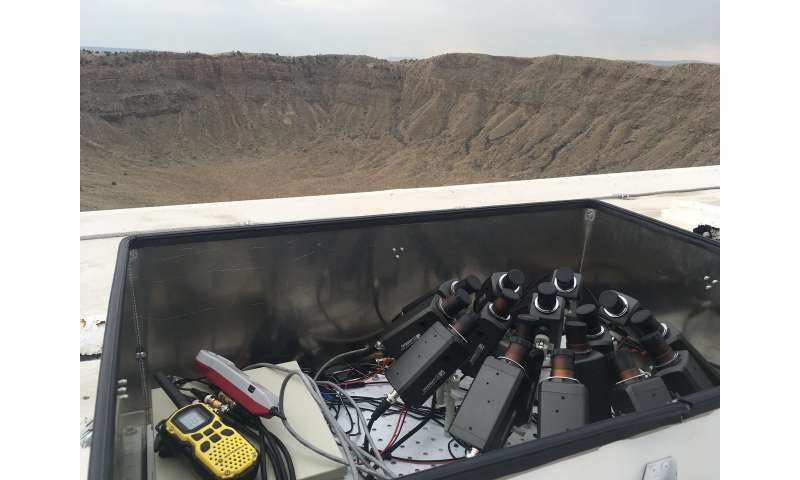 Powerful software combines the meteor detections with those at other stations at Lowell Observatory, Lowell's Discovery Channel Telescope, and at Embry-Riddle Aeronautical University in order to triangulate the meteors and track their motion through the atmosphere. "The cameras pinpoint recovery locations for large meteors that impact Earth," says Nick Moskovitz of Lowell Observatory, who leads the project nicknamed LO-CAMS for "Lowell Observatory CAMS". "Our goal is to discover new meteor showers and better understand meteors and their link to asteroids and comets in the Solar System." LO-CAMS is part of a larger network of cameras called CAMS, "Cameras for All-sky Meteor Surveillance", which originated in California and is led by meteor astronomer Peter Jenniskens of the SETI Institute and NASA Ames Research Center. CAMS stands apart from other modern meteor observing programs in that it uses a fly's eye approach that stitches together the results from an array of 16 cameras, rather than a single camera with a fish eye lens as is typical of other programs. This multi-camera setup results in a more precise determination of meteor positions. "Because this approach uses much more sensitive cameras, trajectories for hundreds of meteors per night are calculated and posted almost immediately on the web," said Moskovitz. "And by measuring these trajectories at high precision, we are able to determine where they came from in the solar system." LO-CAMS started out several years ago with two stations, one at Lowell Observatory's center of operations in Flagstaff, the other at the observatory's Discovery Channel Telescope site 40 miles outside of Flagstaff. More stations mean better accuracy, and Moskovitz envisions one day hosting perhaps a dozen across Arizona. Meteor Crater was created by the impact of a 50-meter-diameter asteroid some 50,000 years ago. Because of its location 35 miles east of Flagstaff, it is at an ideal distance for meteor triangulation. Meteor Crater Enterprises donated the money necessary to build the station. "The board and staff at Meteor Crater are pleased to support Lowell Observatory and the LO-CAMS initiative", said Dwayne Virgint, President and CEO of Meteor Crater Enterprises. "Our location outside of Flagstaff provides a perfect dark-sky opportunity for the meteor surveillance cameras." A few months ago, another new station came on-line at Embry Riddle in Prescott, Arizona. "Embry Riddle was another obvious partner," says Moskovitz. "The university provides opportunities for students to actively engage in research projects like LO-CAMS, and they have a strong history of working on the detection of meteors."